Today’s Gospel recounts the story of the woman accused of adultery. 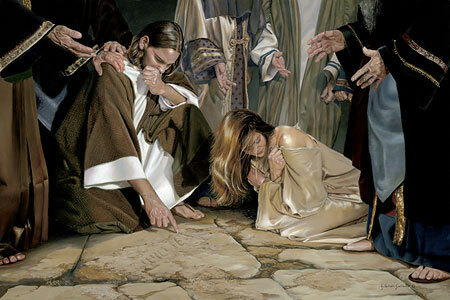 She would have been stoned to death had our Lord not confronted her accusers about their sins. The story invites us to put ourselves in her place and appreciate God’s boundless mercy. Given the digital world today, however, it should also invite us to put ourselves in the place of her would-be stoners, for isn’t that what a lot of people tend to do on social media these days? We need to think about this rising social media phenomenon called “public shaming.” We know what that’s about. We have witnessed these online stonings; we may have even engaged in them. It’s a fashionable thing to do. According to a study, rage is the most-often retweeted emotion. On Twitter, Facebook, and the like, that rage is often wrapped in self-righteous indignation, just like that of the woman’s accusers in the Gospel. When we shame others, we feel immense power and exhilaration. We can actually do something about the racist, homophobic, and other inappropriate posts we see online: We can react to them, correct them, and even condemn them. And we even feel much better when we join others in collective indignation, when we join in the frenzy. The problem is, sometimes we get carried away. And in doing so, we condemn the persons, and not just their acts. When the reaction gets viral, we not only shatter hearts, but also obliterate lives. People who have been victimized by widespread public shaming–including minors!–are NOT given what the Gospel today reminds us that God keeps offering sinners: Second chances. Whether we like it or not, whether we know it or not, social media tends to breed–and multiply–rage and self-righteousness. And if you ever make the mistake of playing Jesus–of confronting the critics or even just placating them–you can be sure that you yourself will be subjected to a cruel round of digital stoning. The result? The reasonable and the compassionate among us end up cowed, our voices silenced by the critics and the trolls. Social media is a dangerous world to live in. If we’re not careful, we can lose ourselves in a noisy, faceless unthinking mob. Without our noticing it, it can turn us into our most monstrous selves. Our Lord reminds us today to stop and think twice before we cast our first stone online. More, he tells us not to be an accomplice: Don’t encourage the stoners by liking their posts or sharing them. Or better still, please don’t come to the stoning.